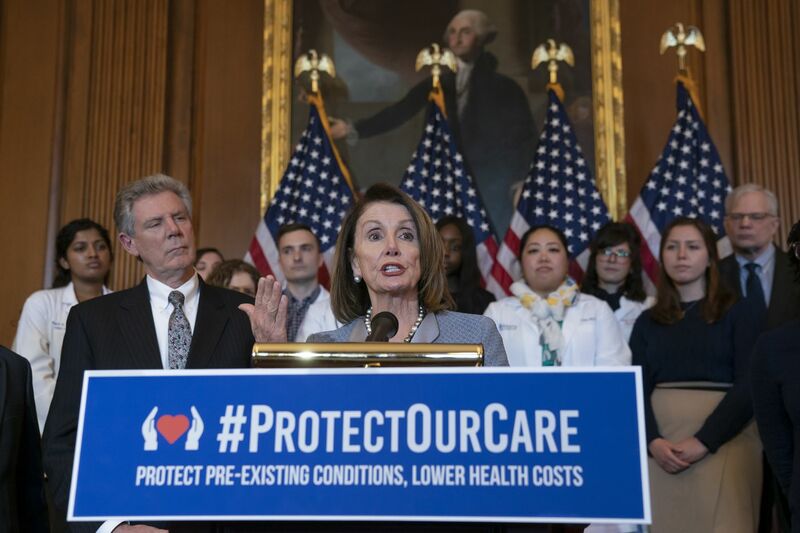 Speaker of the House Nancy Pelosi (D-Calif.) joined at left by Energy and Commerce Committee Chair Frank Pallone (D-N.J.) speaks at an event to announce legislation to lower health care costs and protect people with pre-existing medical conditions last month in Washington. President Donald Trump recently began a renewed effort to dismantle the Affordable Care Act (or Obamacare). Democrats overwhelmingly support the Affordable Care Act and introduced legislation to strengthen it. Republicans have campaigned for the better part of a decade against the health care law, but have not offered an alternative policy that would provide insurance coverage to more Americans and protect coverage for those with pre-existing conditions. Some in the Republican Party are outspoken in their disagreement with entirely repealing the ACA. The ACA was designed to reform health insurance to make it available to many more people, lower health-care costs, guarantee more health-care choices, and enhance the quality of health care for all Americans. Considering that there are provisions in the ACA that support treatment for substance use disorders and that we are in the midst of an opioid crisis that is killing 130 people a day, repealing the ACA would be disastrous. For the first time, treatment for substance use disorder (SUD) is included on a list of essential or required health benefits under the ACA, which was a huge win for people struggling with SUDs or mental health disorders. Some insurance companies have historically avoided paying for these chronic diseases that can require repeated episodes of care, similar to treatment for other chronic diseases such as asthma, diabetes, or hypertension. Many insurers either outright refused coverage or raised co-pays and limited the number of treatment days or sessions, despite the Parity Act that required that restrictions on SUD and mental health treatment could not be more onerous than those applied to other medical disorders. While it is true that implementation and reimbursement by health insurers has not been seamless with the ACA, the legislation has helped move us in the right direction. By including substance use disorder benefits in health insurance packages, more treatment providers offer and are reimbursed for these services, resulting in more individuals having access to treatment and decreasing other, more costly care utilization such as emergency department visits. The ACA also increased the number of people eligible for health care under Medicaid as of 2014, some of whom have needed intervention and treatment services for substance use disorders. The U.S. Department of Health and Human Services reports that prior to the ACA, about one-third of Americans covered in the individual market had no coverage for substance use disorder services. In addition, even when individual market plans provided these benefits, the federal parity law did not apply. More than 47 million Americans had no health insurance coverage altogether, an alarming figure considering that an estimated 25 percent of uninsured adults have a mental health condition or substance use disorder or both. Treatment for drug and other substance abuse and addiction falls under the ACA’s mental and behavioral health treatment benefit. Another of the 10 specified essential benefits of the ACA requires coverage for preventive and wellness visits, including chronic disease management. Addiction is a chronic disease, to be clear. The ACA requires that procedures recommended by the U.S. Preventive Services Task Force be covered as preventive services including alcohol misuse screening and counseling, and alcohol and drug use assessments for adolescents. If the ACA is repealed, the New York Times reported in March, 21 million people could lose health care coverage, 12 million could lose their Medicaid, and 2 million young adults would be booted off their parents’ health plans. We will be in store for a far worse opioid epidemic and endanger the more than 20 million Americans struggling with substance use disorder. Unless someone comes up with a comprehensive alternative, repealing the ACA will most certainly come at a steep price of American lives. Deni Carise is chief scientific officer of Recovery Centers of America and adjunct clinical assistant professor at the University of Pennsylvania School of Medicine.